For the turbulence felt on an airplane, see Clear-air turbulence. For other uses, see Turbulence (disambiguation). In fluid dynamics, turbulence or turbulent flow is fluid motion characterized by chaotic changes in pressure and flow velocity. It is in contrast to a laminar flow, which occurs when a fluid flows in parallel layers, with no disruption between those layers. Turbulence is commonly observed in everyday phenomena such as surf, fast flowing rivers, billowing storm clouds, or smoke from a chimney, and most fluid flows occurring in nature or created in engineering applications are turbulent. :2 Turbulence is caused by excessive kinetic energy in parts of a fluid flow, which overcomes the damping effect of the fluid's viscosity. For this reason turbulence is commonly realized in low viscosity fluids. In general terms, in turbulent flow, unsteady vortices appear of many sizes which interact with each other, consequently drag due to friction effects increases. This increases the energy needed to pump fluid through a pipe. Turbulence can be exploited, for example, by devices such as aerodynamic spoilers on aircraft that "spoil" the laminar flow to increase drag and reduce lift. The onset of turbulence can be predicted by the dimensionless Reynolds number, the ratio of kinetic energy to viscous damping in a fluid flow. However, turbulence has long resisted detailed physical analysis, and the interactions within turbulence create a very complex phenomenon. Richard Feynman has described turbulence as the most important unsolved problem in classical physics. 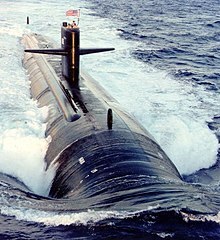 Laminar and turbulent water flow over the hull of a submarine. As the relative velocity of the water increases turbulence occurs. Smoke rising from a cigarette. For the first few centimeters, the smoke is laminar. The smoke plume becomes turbulent as its Reynolds number increases with increases in flow velocity and characteristic lengthscale. Flow over a golf ball. (This can be best understood by considering the golf ball to be stationary, with air flowing over it.) If the golf ball were smooth, the boundary layer flow over the front of the sphere would be laminar at typical conditions. However, the boundary layer would separate early, as the pressure gradient switched from favorable (pressure decreasing in the flow direction) to unfavorable (pressure increasing in the flow direction), creating a large region of low pressure behind the ball that creates high form drag. To prevent this, the surface is dimpled to perturb the boundary layer and promote turbulence. This results in higher skin friction, but it moves the point of boundary layer separation further along, resulting in lower drag. Clear-air turbulence experienced during airplane flight, as well as poor astronomical seeing (the blurring of images seen through the atmosphere). Most of the terrestrial atmospheric circulation. The flow conditions in many industrial equipment (such as pipes, ducts, precipitators, gas scrubbers, dynamic scraped surface heat exchangers, etc.) and machines (for instance, internal combustion engines and gas turbines). The external flow over all kinds of vehicles such as cars, airplanes, ships, and submarines. Biologically generated turbulence resulting from swimming animals affects ocean mixing. Is it possible to make a theoretical model to describe the behavior of a turbulent flow — in particular, its internal structures? Snow fences work by inducing turbulence in the wind, forcing it to drop much of its snow load near the fence. Bridge supports (piers) in water. In the late summer and fall, when river flow is slow, water flows smoothly around the support legs. In the spring, when the flow is faster, a higher Reynolds number is associated with the flow. The flow may start off laminar but is quickly separated from the leg and becomes turbulent. In many geophysical flows (rivers, atmospheric boundary layer), the flow turbulence is dominated by the coherent structures and turbulent events. A turbulent event is a series of turbulent fluctuations that contain more energy than the average flow turbulence. The turbulent events are associated with coherent flow structures such as eddies and turbulent bursting, and they play a critical role in terms of sediment scour, accretion and transport in rivers as well as contaminant mixing and dispersion in rivers and estuaries, and in the atmosphere. Recently, turbulence in porous media became a highly debated subject. Turbulent flows are always highly irregular. For this reason, turbulence problems are normally treated statistically rather than deterministically. Turbulent flow is chaotic. However, not all chaotic flows are turbulent. The readily available supply of energy in turbulent flows tends to accelerate the homogenization (mixing) of fluid mixtures. The characteristic which is responsible for the enhanced mixing and increased rates of mass, momentum and energy transports in a flow is called "diffusivity". Turbulent diffusion is usually described by a turbulent diffusion coefficient. This turbulent diffusion coefficient is defined in a phenomenological sense, by analogy with the molecular diffusivities, but it does not have a true physical meaning, being dependent on the flow conditions, and not a property of the fluid itself. In addition, the turbulent diffusivity concept assumes a constitutive relation between a turbulent flux and the gradient of a mean variable similar to the relation between flux and gradient that exists for molecular transport. In the best case, this assumption is only an approximation. Nevertheless, the turbulent diffusivity is the simplest approach for quantitative analysis of turbulent flows, and many models have been postulated to calculate it. For instance, in large bodies of water like oceans this coefficient can be found using Richardson's four-third power law and is governed by the random walk principle. In rivers and large ocean currents, the diffusion coefficient is given by variations of Elder's formula. Turbulent flows have non-zero vorticity and are characterized by a strong three-dimensional vortex generation mechanism known as vortex stretching. In fluid dynamics, they are essentially vortices subjected to stretching associated with a corresponding increase of the component of vorticity in the stretching direction—due to the conservation of angular momentum. On the other hand, vortex stretching is the core mechanism on which the turbulence energy cascade relies to establish the structure function. [clarification needed] In general, the stretching mechanism implies thinning of the vortices in the direction perpendicular to the stretching direction due to volume conservation of fluid elements. As a result, the radial length scale of the vortices decreases and the larger flow structures break down into smaller structures. The process continues until the small scale structures are small enough that their kinetic energy can be transformed by the fluid's molecular viscosity into heat. This is why turbulence is always rotational and three dimensional. For example, atmospheric cyclones are rotational but their substantially two-dimensional shapes do not allow vortex generation and so are not turbulent. On the other hand, oceanic flows are dispersive but essentially non rotational and therefore are not turbulent. To sustain turbulent flow, a persistent source of energy supply is required because turbulence dissipates rapidly as the kinetic energy is converted into internal energy by viscous shear stress. Turbulence causes the formation of eddies of many different length scales. Most of the kinetic energy of the turbulent motion is contained in the large-scale structures. The energy "cascades" from these large-scale structures to smaller scale structures by an inertial and essentially inviscid mechanism. This process continues, creating smaller and smaller structures which produces a hierarchy of eddies. Eventually this process creates structures that are small enough that molecular diffusion becomes important and viscous dissipation of energy finally takes place. The scale at which this happens is the Kolmogorov length scale. Via this energy cascade, turbulent flow can be realized as a superposition of a spectrum of flow velocity fluctuations and eddies upon a mean flow. The eddies are loosely defined as coherent patterns of flow velocity, vorticity and pressure. Turbulent flows may be viewed as made of an entire hierarchy of eddies over a wide range of length scales and the hierarchy can be described by the energy spectrum that measures the energy in flow velocity fluctuations for each length scale (wavenumber). The scales in the energy cascade are generally uncontrollable and highly non-symmetric. Nevertheless, based on these length scales these eddies can be divided into three categories. is the time lag between measurements. where r is the distance between two measurement locations, and u′ is the velocity fluctuation in that same direction. Smallest scales in the spectrum that form the viscous sub-layer range. In this range, the energy input from nonlinear interactions and the energy drain from viscous dissipation are in exact balance. The small scales have high frequency, causing turbulence to be locally isotropic and homogeneous. The intermediate scales between the largest and the smallest scales which make the inertial subrange. Taylor microscales are not dissipative scale but pass down the energy from the largest to the smallest without dissipation. Some literatures do not consider Taylor microscales as a characteristic length scale and consider the energy cascade to contain only the largest and smallest scales; while the latter accommodate both the inertial subrange and the viscous sublayer. Nevertheless, Taylor microscales are often used in describing the term “turbulence” more conveniently as these Taylor microscales play a dominant role in energy and momentum transfer in the wavenumber space. Although it is possible to find some particular solutions of the Navier–Stokes equations governing fluid motion, all such solutions are unstable to finite perturbations at large Reynolds numbers. Sensitive dependence on the initial and boundary conditions makes fluid flow irregular both in time and in space so that a statistical description is needed. The Russian mathematician Andrey Kolmogorov proposed the first statistical theory of turbulence, based on the aforementioned notion of the energy cascade (an idea originally introduced by Richardson) and the concept of self-similarity. As a result, the Kolmogorov microscales were named after him. It is now known that the self-similarity is broken so the statistical description is presently modified. A complete description of turbulence is one of the unsolved problems in physics. According to an apocryphal story, Werner Heisenberg was asked what he would ask God, given the opportunity. His reply was: "When I meet God, I am going to ask him two questions: Why relativity? And why turbulence? I really believe he will have an answer for the first." A similar witticism has been attributed to Horace Lamb (who had published a noted text book on Hydrodynamics)—his choice being quantum electrodynamics (instead of relativity) and turbulence. Lamb was quoted as saying in a speech to the British Association for the Advancement of Science, "I am an old man now, and when I die and go to heaven there are two matters on which I hope for enlightenment. One is quantum electrodynamics, and the other is the turbulent motion of fluids. And about the former I am rather optimistic." The onset of turbulence can be, to some extent, predicted by the Reynolds number, which is the ratio of inertial forces to viscous forces within a fluid which is subject to relative internal movement due to different fluid velocities, in what is known as a boundary layer in the case of a bounding surface such as the interior of a pipe. A similar effect is created by the introduction of a stream of higher velocity fluid, such as the hot gases from a flame in air. This relative movement generates fluid friction, which is a factor in developing turbulent flow. Counteracting this effect is the viscosity of the fluid, which as it increases, progressively inhibits turbulence, as more kinetic energy is absorbed by a more viscous fluid. The Reynolds number quantifies the relative importance of these two types of forces for given flow conditions, and is a guide to when turbulent flow will occur in a particular situation. 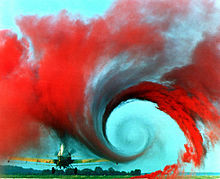 This ability to predict the onset of turbulent flow is an important design tool for equipment such as piping systems or aircraft wings, but the Reynolds number is also used in scaling of fluid dynamics problems, and is used to determine dynamic similitude between two different cases of fluid flow, such as between a model aircraft, and its full size version. Such scaling is not always linear and the application of Reynolds numbers to both situations allows scaling factors to be developed. 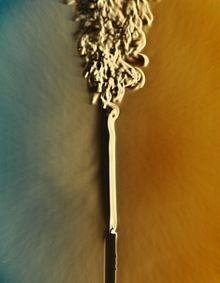 A flow situation in which the kinetic energy is significantly absorbed due to the action of fluid molecular viscosity gives rise to a laminar flow regime. For this the dimensionless quantity the Reynolds number (Re) is used as a guide. turbulent flow occurs at high Reynolds numbers and is dominated by inertial forces, which tend to produce chaotic eddies, vortices and other flow instabilities. While there is no theorem directly relating the non-dimensional Reynolds number to turbulence, flows at Reynolds numbers larger than 5000 are typically (but not necessarily) turbulent, while those at low Reynolds numbers usually remain laminar. In Poiseuille flow, for example, turbulence can first be sustained if the Reynolds number is larger than a critical value of about 2040; moreover, the turbulence is generally interspersed with laminar flow until a larger Reynolds number of about 4000. The transition occurs if the size of the object is gradually increased, or the viscosity of the fluid is decreased, or if the density of the fluid is increased. When flow is turbulent, particles exhibit additional transverse motion which enhances the rate of energy and momentum exchange between them thus increasing the heat transfer and the friction coefficient. and similarly for temperature (T = T + T′) and pressure (P = P + P′), where the primed quantities denote fluctuations superposed to the mean. This decomposition of a flow variable into a mean value and a turbulent fluctuation was originally proposed by Osborne Reynolds in 1895, and is considered to be the beginning of the systematic mathematical analysis of turbulent flow, as a sub-field of fluid dynamics. While the mean values are taken as predictable variables determined by dynamics laws, the turbulent fluctuations are regarded as stochastic variables. where cP is the heat capacity at constant pressure, ρ is the density of the fluid, μturb is the coefficient of turbulent viscosity and kturb is the turbulent thermal conductivity. 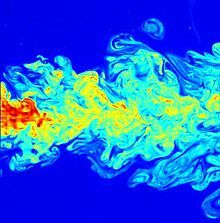 Richardson's notion of turbulence was that a turbulent flow is composed by "eddies" of different sizes. The sizes define a characteristic length scale for the eddies, which are also characterized by flow velocity scales and time scales (turnover time) dependent on the length scale. The large eddies are unstable and eventually break up originating smaller eddies, and the kinetic energy of the initial large eddy is divided into the smaller eddies that stemmed from it. These smaller eddies undergo the same process, giving rise to even smaller eddies which inherit the energy of their predecessor eddy, and so on. In this way, the energy is passed down from the large scales of the motion to smaller scales until reaching a sufficiently small length scale such that the viscosity of the fluid can effectively dissipate the kinetic energy into internal energy. In his original theory of 1941, Kolmogorov postulated that for very high Reynolds numbers, the small scale turbulent motions are statistically isotropic (i.e. no preferential spatial direction could be discerned). In general, the large scales of a flow are not isotropic, since they are determined by the particular geometrical features of the boundaries (the size characterizing the large scales will be denoted as L). Kolmogorov's idea was that in the Richardson's energy cascade this geometrical and directional information is lost, while the scale is reduced, so that the statistics of the small scales has a universal character: they are the same for all turbulent flows when the Reynolds number is sufficiently high. This is today known as the Kolmogorov length scale (see Kolmogorov microscales). A turbulent flow is characterized by a hierarchy of scales through which the energy cascade takes place. Dissipation of kinetic energy takes place at scales of the order of Kolmogorov length η, while the input of energy into the cascade comes from the decay of the large scales, of order L. These two scales at the extremes of the cascade can differ by several orders of magnitude at high Reynolds numbers. In between there is a range of scales (each one with its own characteristic length r) that has formed at the expense of the energy of the large ones. These scales are very large compared with the Kolmogorov length, but still very small compared with the large scale of the flow (i.e. η ≪ r ≪ L). Since eddies in this range are much larger than the dissipative eddies that exist at Kolmogorov scales, kinetic energy is essentially not dissipated in this range, and it is merely transferred to smaller scales until viscous effects become important as the order of the Kolmogorov scale is approached. Within this range inertial effects are still much larger than viscous effects, and it is possible to assume that viscosity does not play a role in their internal dynamics (for this reason this range is called "inertial range"). Hence, a third hypothesis of Kolmogorov was that at very high Reynolds number the statistics of scales in the range η ≪ r ≪ L are universally and uniquely determined by the scale r and the rate of energy dissipation ε.
where C would be a universal constant. This is one of the most famous results of Kolmogorov 1941 theory, and considerable experimental evidence has accumulated that supports it. where the brackets denote the statistical average, and the Cn would be universal constants. Since the experimental values obtained for the second order structure function only deviate slightly from the 2/3 value predicted by Kolmogorov theory, the value for p is very near to 5/3 (differences are about 2%). Thus the "Kolmogorov −5/3 spectrum" is generally observed in turbulence. However, for high order structure functions the difference with the Kolmogorov scaling is significant, and the breakdown of the statistical self-similarity is clear. This behavior, and the lack of universality of the Cn constants, are related with the phenomenon of intermittency in turbulence. This is an important area of research in this field, and a major goal of the modern theory of turbulence is to understand what is really universal in the inertial range. ^ Batchelor, G. (2000). Introduction to Fluid Mechanics. ^ Ting, F. C. K.; Kirby, J. T. (1996). "Dynamics of surf-zone turbulence in a spilling breaker". Coastal Engineering. 27 (3–4): 131–160. doi:10.1016/0378-3839(95)00037-2. ^ a b Tennekes, H.; Lumley, J. L. (1972). A First Course in Turbulence. MIT Press. ^ Eames, I.; Flor, J. B. (January 17, 2011). "New developments in understanding interfacial processes in turbulent flows". Philosophical Transactions of the Royal Society A. 369 (1937): 702–705. Bibcode:2011RSPTA.369..702E. doi:10.1098/rsta.2010.0332. PMID 21242127. ^ Kunze, Eric; Dower, John F.; Beveridge, Ian; Dewey, Richard; Bartlett, Kevin P. (2006-09-22). "Observations of Biologically Generated Turbulence in a Coastal Inlet". Science. 313 (5794): 1768–1770. Bibcode:2006Sci...313.1768K. doi:10.1126/science.1129378. ISSN 0036-8075. PMID 16990545. ^ Narasimha, R.; Rudra Kumar, S.; Prabhu, A.; Kailas, S. V. (2007). "Turbulent flux events in a nearly neutral atmospheric boundary layer" (PDF). Philosophical Transactions of the Royal Society A: Mathematical, Physical and Engineering Sciences. 365 (1852): 841–858. Bibcode:2007RSPTA.365..841N. doi:10.1098/rsta.2006.1949. PMID 17244581. ^ Trevethan, M.; Chanson, H. (2010). "Turbulence and Turbulent Flux Events in a Small Estuary". Environmental Fluid Mechanics. 10 (3): 345–368. doi:10.1007/s10652-009-9134-7. ^ Jin, Y.; Uth, M.-F.; Kuznetsov, A. V.; Herwig, H. (2 February 2015). "Numerical investigation of the possibility of macroscopic turbulence in porous media: a direct numerical simulation study". Journal of Fluid Mechanics. 766: 76–103. Bibcode:2015JFM...766...76J. doi:10.1017/jfm.2015.9. ^ a b Tennekes, Hendrik (1972). A First Course in Turbulence. The MIT Press. ^ Marshak, Alex (2005). 3D radiative transfer in cloudy atmospheres. Springer. p. 76. ISBN 978-3-540-23958-1. ^ Mullin, Tom (11 November 1989). "Turbulent times for fluids". New Scientist. ^ Davidson, P. A. (2004). Turbulence: An Introduction for Scientists and Engineers. Oxford University Press. ISBN 978-0-19-852949-1. ^ Sommerfeld, Arnold (1908). "Ein Beitrag zur hydrodynamischen Erkläerung der turbulenten Flüssigkeitsbewegüngen" [A Contribution to Hydrodynamic Explanation of Turbulent Fluid Motions]. International Congress of Mathematicians. 3: 116–124. ^ Avila, K.; Moxey, D.; de Lozar, A.; Avila, M.; Barkley, D.; B. Hof (July 2011). "The Onset of Turbulence in Pipe Flow". Science. 333 (6039): 192–196. Bibcode:2011Sci...333..192A. doi:10.1126/science.1203223. PMID 21737736. ^ Frisch, U. (1995). Turbulence: The Legacy of A. N. Kolmogorov. Cambridge University Press. ISBN 9780521457132. Falkovich, Gregory; Sreenivasan, K. R. (April 2006). "Lessons from hydrodynamic turbulence" (PDF). Physics Today. 59 (4): 43–49. Bibcode:2006PhT....59d..43F. doi:10.1063/1.2207037. Frisch, U. (1995). Turbulence: The Legacy of A. N. Kolmogorov. Cambridge University Press. ISBN 9780521457132. Cardy, J.; Falkovich, G.; Gawedzki, K. (2008). Non-equilibrium Statistical Mechanics and Turbulence. Cambridge University Press. ISBN 9780521715140. Durbin, P. A.; Pettersson Reif, B. A. (2001). Statistical Theory and Modeling for Turbulent Flows. John Wiley & Sons. ISBN 978-0-470-68931-8. Bohr, T.; Jensen, M. H.; Paladin, G.; Vulpiani, A. (1998). Dynamical Systems Approach to Turbulence. Cambridge University Press. ISBN 9780521475143. McDonough, J. M. (2007). "Introductory Lectures on Turbulence – Physics, Mathematics, and Modeling" (PDF). University of Kentucky. Nieuwstadt, F. T. M.; Boersma, B. J.; Westerweel, J. (2016). Turbulence – Introduction to Theory and Applications of Turbulent Flows (Online ed.). Springer. ISBN 978-3-319-31599-7. Kolmogorov, Andrey Nikolaevich (1941). "The local structure of turbulence in incompressible viscous fluid for very large Reynolds numbers". Proceedings of the USSR Academy of Sciences (in Russian). 30: 299–303. Translated into English: Kolmogorov, Andrey Nikolaevich (July 8, 1991). Translated by Levin, V. "The local structure of turbulence in incompressible viscous fluid for very large Reynolds numbers" (PDF). Proceedings of the Royal Society A. 434 (1991): 9–13. Bibcode:1991RSPSA.434....9K. doi:10.1098/rspa.1991.0075. Archived from the original (PDF) on September 23, 2015. Kolmogorov, Andrey Nikolaevich (1941). "Dissipation of Energy in Locally Isotropic Turbulence". Proceedings of the USSR Academy of Sciences (in Russian). 32: 16–18. Translated into English: Kolmogorov, Andrey Nikolaevich (July 8, 1991). "The local structure of turbulence in incompressible viscous fluid for very large Reynolds numbers" (PDF). Proceedings of the Royal Society A. 434 (1980): 15–17. Bibcode:1991RSPSA.434...15K. doi:10.1098/rspa.1991.0076. Archived from the original (PDF) on July 6, 2011. Batchelor, G. K. (1953). The Theory of Homogeneous Turbulence. Cambridge University Press.